Its exterior is made with carved screed (artificiel), a technique which has been quite popular in our country for several decades. 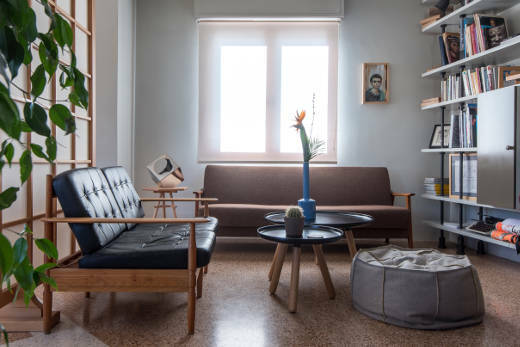 In order to be accomplished, a cementitious plaster from natural material, whose form was fashioned by the respective handicraftsman with a special tool that looked like a hammer, was used on the walls. When the building came to our hands its original exterior had greatly effaced because of the use through times. The “artificiel’s” rough surface had been covered with several coats of synthetic paint and pollutants. This led to the corruption of the aesthetic identity of a building which, in any other case, due to its location as well as its oldness, could serve as a landmark for the Larisa city center. The architectural design and the changes made were intended to restore the exterior walls to their original form. After the scaffolding was placed, the exterior was cleaned by professionals without the use of chemicals. Gradually, after weeks of constant labour, all the paint coats were removed, and a white hewn screed came to surface. The existing frames around the windows and sashes were scrubbed and painted, while the old joinery was replaced by a new, wooden, doubled glazed one which meets the contemporary environmental requirements for energy saving. Finally, a lighting design was carried out to soundly highlight the building during night time and better mark the entrance in Hephaestus Street. Today, across the 1rst Ancient Theater of Larisa, the Linto Organisation headquarters stand all-white and restored. The rough exterior surfaces, carved by hand, other than their aesthetic, take us to a different era, when handiwork and traditional craftsmen’s love of what they took up- or as we call it “meraki”-, were a top value of everyday life, represent in the best possible way, what we attempt to offer. Christos A. Tessas, Architecture Engineer. The main and only entrance of the Linto Organisation is on Hephaestus Street, where there is a small reception and which has been extended. Also the stairs have adequately been reformed to facilitate access to the rest of the floors. The first level of the facilities has been adequately formed for individual or team work, reading, business meetings, meeting and study groups. The space is a studio; however, specific parts can be isolated for more private conversations if needed. There you will be able to find desks and comfortable working seats, as well as two relaxing lounge areas and the library. In the entrance of level A area you may also find the secretariat, which offers information and basic support to the organization members and subscribers. Lectures, seminars, speeches, presentations and cultural events, for example shows and musical meetings, will be hosted on this level. The stage is the focal point in the room and it is bounded by the auditorium. 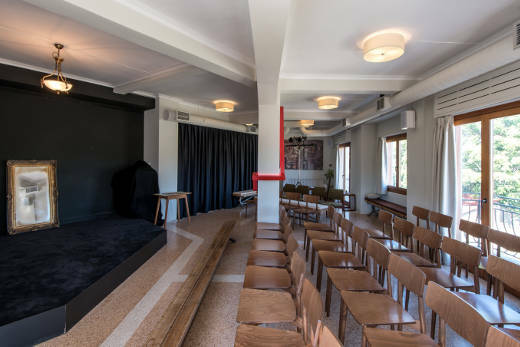 Up to 50 spectators can be hosted here, and of course it is fully equipped with sound installation, stage lights, a projector etc.. The green roof has been adequately designed and equipped in order to function as a resort and smoking area for the members all year round, while during summer time, as a meeting and event venue, with an unobstructed view to the most important historical monuments of the city. After dark, private meetings, full of character, can take place there- a prerogative for the members but also any other interested party. During the Ottoman occupation the area where the building is located was called “Tsougari” and it was famous for its inns. It was a stop and overnight stay point for both people and animals heading to North Greece. After Thessaly integration to the Greek State in 1881, the particular area, from Hephaestus Street to Acropolis Street (present Papanastasiou) and up to Manolaki Street, was known as Xilopazaro (Wood fair), because it consisted the main wood market. The two-storey building where Linto Organization is housed, is a typical example of urban 50s architecture. 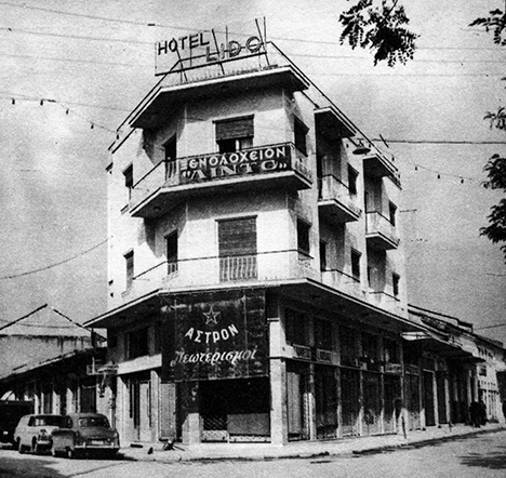 In the year 1957, when the building was constructed, it was decided it would function as a hotel, while the ground floor would service as a site for stores. The reason behind this decision was the commercial development of the area. 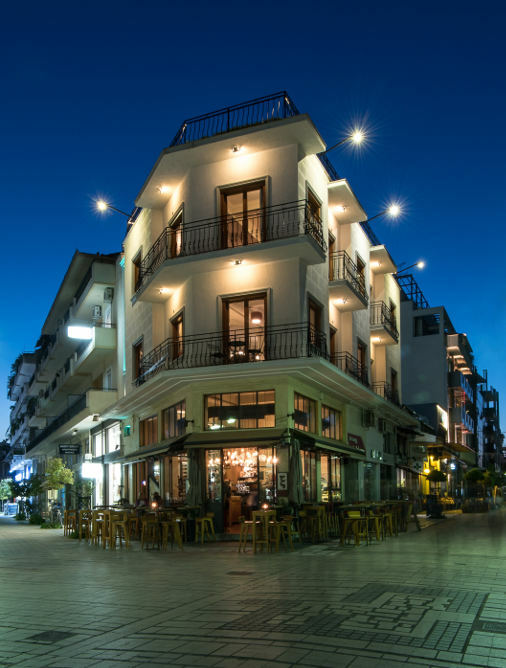 The name Linto was first chosen to attribute a cosmopolitan aura to the surrounding area of the “touristic” Larisa city and in the process it became synonymous to its foxy and suspicious snugness. 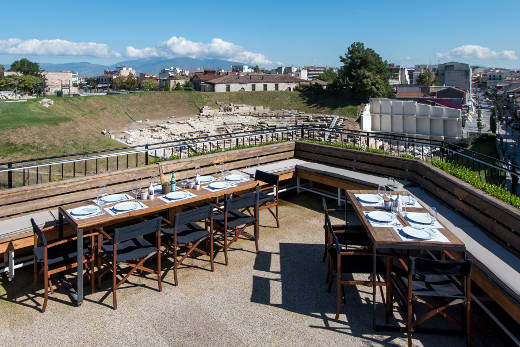 Since 2006 and after the 1st Ancient Theater of Larisa excavation, the pedestrianisation and the upgrading of the area, the need for a concerted to the times use became obvious.